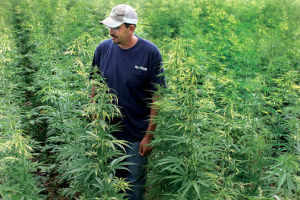 Murray State University Farm Manager Jason Robertson is shown Thursday standing in a plot of shoulder-high industrial hemp plants in an undisclosed location. This plot was planted using no-till technique and the performance of the plant so far seems to have answered an anticipated question about hemp and no till. On May 12, Murray State University made history by becoming the first entity of any type in the nation to legally place industrial hemp seeds in the ground as part of a statewide trial. And as this was happening, one of the more anticipated tests had to do with how the crop would perform under no-till conditions. So far, the results seem to be mostly positive. “Right now, that’s where are best plantings are. They’re shoulder high in places and they were only waist high a week ago,” said Dr. Tony Brannon, dean of MSU’s Hutson School of Agriculture. “One of the reasons we think that’s happening is because of better germination made possible by it raining real, real hard a few times since they were planted. It really got packed in where we worked the ground. Brannon admits that it is still very early in the process, but the results so far seem to confirm a widely-held belief that the plant is very tough to harm. One of those rainfalls of which Brannon spoke came in early June, resulting in very high winds that formed a macroburst north and east of Murray. No-till farming is a type of planting designed to prevent soil erosion that does not involve plowing an entire field and revealing all dirt. With no-till farming, the planting process involves cultivating over existing grasses or crop residue, requiring careful placement of the seeds. MSU became the first Kentucky college/university to put its seeds in the ground after Congress approved its farm bill earlier this year. That bill included a provision for colleges/universities to perform informational trials over a year’s time in which all participants will report on their findings at the end of that period. Brannon said that provision was heavily pushed by Kentucky Agriculture Commissioner James Comer with support in Washington from both Kentucky United States senators, Mitch McConnell and Rand Paul. State lawmakers passed legislation in advance of that action as well. Industrial hemp has a growing period of 90 to 120 days. Shorter growing times would be to harvest seeds, while longer times will be geared toward obtaining the fiber. Brannon said, at this time, he believes MSU’s plan is to aim at obtaining fiber, meaning harvest will not be until September or October.